Printed handbill reproducing a letter from Hensley, headed '(From "THE TIMES," October 17, 1888.) | SLOUGH AND M. ARAGO. | TO THE EDITOR OF THE TIMES. 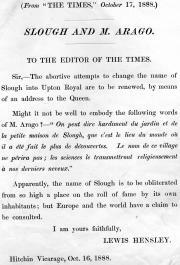 ', deploring the proposed change of the name of the twon from Slough to Upton Royal. 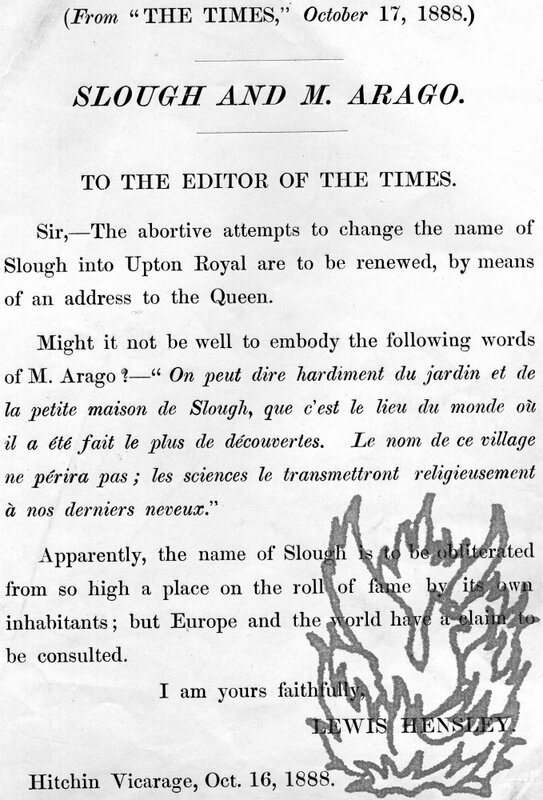 Hitchin Vicarage, Oct. 16, 1888. On one side of a piece of wove paper, 32 x 24 cm. Text clear and complete. Fair, on lightly-aged and creased paper, with slight wear to extremities. Headed '(From "THE TIMES," October 17, 1888.) SLOUGH AND M. ARAGO. TO THE EDITOR OF THE TIMES.' The letter is thirteen lines long, ephatically printed in good-sized type. Signed in type 'LEWIS HENSLEY. | Hitchin Vicarage, Oct.